Oh, let me guess; you're taking them to see "King Kong"? The baby monkey has forgotten his banana bed! This is just sick. I don't understand why you had to sever that large monkey's head from the rest of his body! All for some evil purpose I presume! And worse yet, we still don't have this "reason"! Sick! Sick! Sick! I know. You're tired of having them watch you go potty. Right? 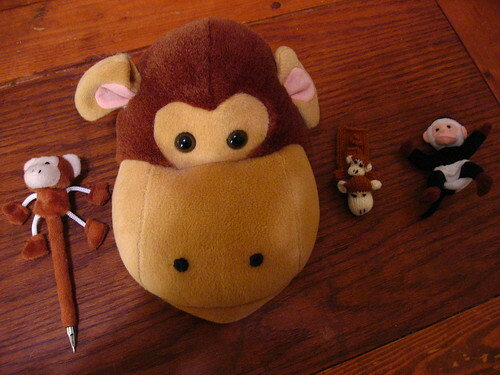 Finger puppet monkeys are very versatile! I don't think you actually cut the head off a monkey (you do not have such cruelty in you). Instead the monkey is standing underneath the table, the top of which has been cunningly cut with a hole. Am I right? Do I win a prize? Is it money? Can I have it now please? Please? You don't win because you have overlooked the obvious "One of these things is not like the others." The poor monkey with the large head is suffering from Simpson's syndrome. Its head is so large it is concealing its body underneath it. I think Esther gathered the monkeys together so the normal monkeys can make fun of "big-head." Monkeys, I want you to know that going to war is never an easy decision. But sometimes it's the right decision. Some of you may not come back, but I want you to know that you will never be forgotten. Plush monkeys will always remember your sacrifice. I want you to stay close to Giant Monkey Head. He's been through this before. He knows the score. If anyone's going to see you back to your plush monkey wives and plush monkey children, it will be this monkey. Surely, if the big monkey had Simpson's syndrome it would be yellow. I still think I deserve a prize. I am extremely concerned about the monkey on the left....you know, the one with the giant, pointy, ink-filled pee-pee. The fact that Esther has this many monkeys is hilarious in it's own right. I mean, not one, no. Nor two. But FIVE MONKEYS!!! Rob Miles is correct. As usual, prizes are awarded in Olam Haba unless otherwise stipulated in post. I've done some research on Olam Haba. I think it roughly translates to "You'll get nothing in this life matey". And it won't even raise a good Scrabble score. Even on a triple word. I feel cheated. I now order your monkeys to rise up as one and the big one with the table round his neck must give you a sound thrashing. Or a quiet beating. Either will suffice.